Although I personally have always been interested in and since I started to read the Bible completely from a literal perspective have a belief in a literal Millenial Kingdom, it wasn't clear to me or I didn't think about it very much before exactly where Jesus the Messiah would dwell in the Messianic Age. This was further confused when I saw some interpretations that I still believe from Ezekiel that the place of the Messianic Age Temple or Sanctuary will be separate from "the city". In this view "the city" will be south of the Sanctuary also in the place for the Prince. From Ezekiel 37:25 where the prince is identified as David as well as the prince being described as having children and offering sacrifices for his sins he couldn't be the sinless Messiah Jesus. Very recently a Christian friend when I was discussing Bible prophecy with the person asked where Jesus the Messiah would dwell in the Messianic Kingdom. I at that time had to confess I didn't know but this also motivated me to search the Bible to find the answer which by God's grace I have in many scriptures. For whatever reason I have yet to see any artwork in books or Christian literature in sketches, paintings or computer graphics of scenes of Messiah Jesus and/or God the Father's glory in the Temple in the Messianic Age but hopefully I will find this soon as I believe it would be very inspiring. Following is a Bible study showing that both Jesus the Messiah and Son of God and the glory of God the Father will dwell in the Temple and rule Jerusalem, Israel and the world in the Messianic Age from the Temple. In the last 5 verses of the last chapter, chapter 9, of the prophetical book of Amos in the Old Testament or Hebrew Scriptures there are some verses focused on the Millennial or Messianic Kingdom of God through His Son Jesus Christ. The Lord Jesus Christ with the Shekinah glory of God the Father will set up His Kingdom over all the earth focused on Jerusalem and Israel with the second coming in glory from heaven with His true Church and departed saints of Old Israel or believers of the Gentiles who have passed from this world by then from the Old Testament times or from the then immediately prior 7 year tribulation or 70th week of Daniel. 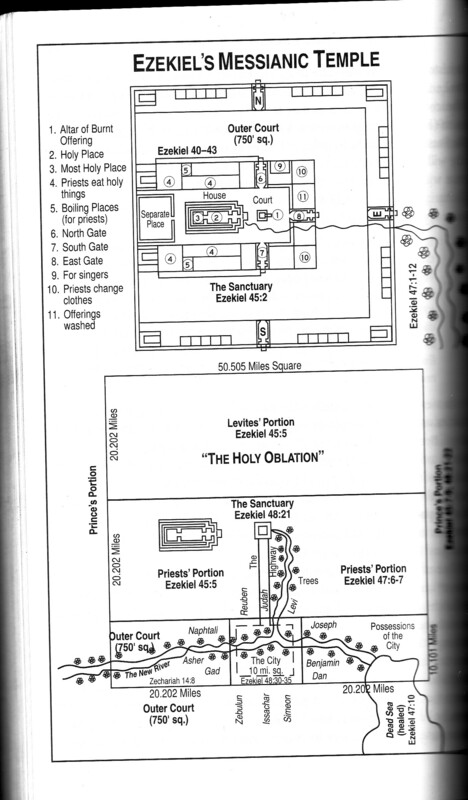 There is reference to the building of the Messianic or Millennial Kingdom temple in places like Zechariah 6:9-15 and Ezekiel 40-42 in God's word the Holy Bible. However one thing I was confused or uncertain about before was where there is specific reference in God's word the Holy Bible of the destruction of the tribulation Temple that the Antichrist or Beast out of the Sea will allow Israel to build in the tribulation or 70th week of Daniel according to Daniel 9:27 and Revelation 11:1-2. The Antichrist will take over this temple half way through the 7 year tribulation for forced worship of himself by the people of the world in the second half of the tribulation as in Matthew 24:15, the latter part of Daniel 9:27, 2 Thessalonians 2:3-4, Daniel 12:11. This will defile that temple and make it unfit for it to be the dwelling and ruling place and pilgrimage place for worship of Messiah the Lord Jesus (Y'Shua) and God the Father (the LORD or HaShem) in the Millennial or Messianic Kingdom.